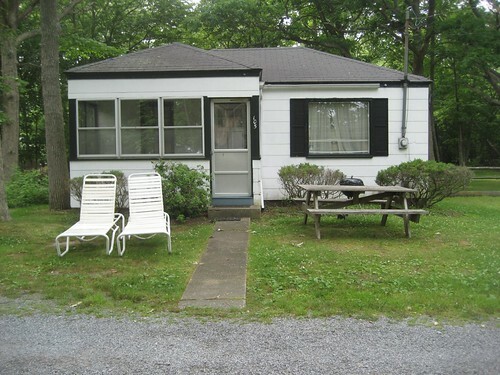 Summer’s officially here and I am so very excited for all of the fun we have planned – like our stay at the lovingly restored 1950s Caribbean Motel in Wildwood, NJ. There’s us, in line for a hot dog, in this vintage photo from the Caribbean, courtesy of our pals at RetroStockPix.com. 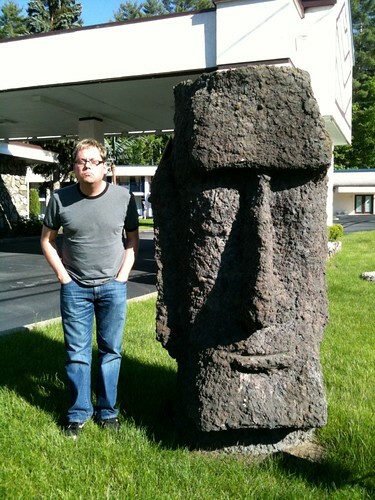 Memory Motel – Thank You For The Retro Road Trip Planning Help, American Road Magazine! I find the “where are we going to sleep?” part of planning a retro road trip to be the least fun part of all roadtrip preparation. 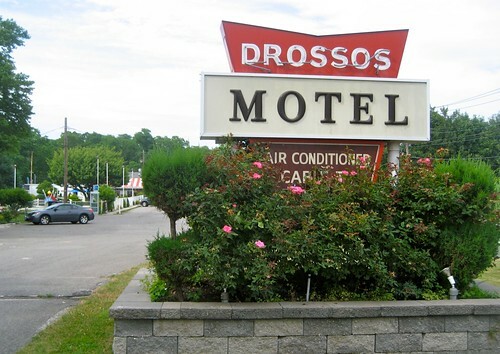 While I want to champion the vintage retro and cool old places, some motels and hotels that opened with the best intentions years ago now just give me the willies! You can see this by the small number of hotels and motels listed on the retroroadmaps- I’m very picky about where I stay, and even more concerned about recommending a place for others to spend the night. Luckily we have a little bit of help with the Memory Motel department of American Road magazine to help us with some vintage motel suggestions. 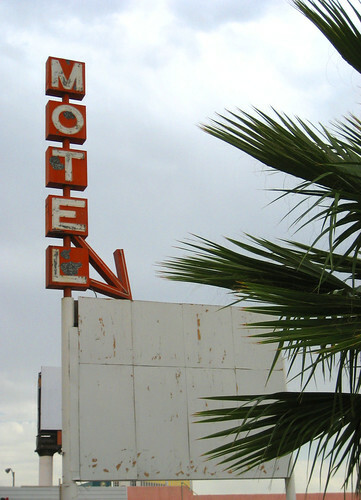 Our Memory Motel department offers pleasant memories of days gone by and how you can recapture them. Be sure your car keys are close by because you might discover a little slice of heaven just around the bend! 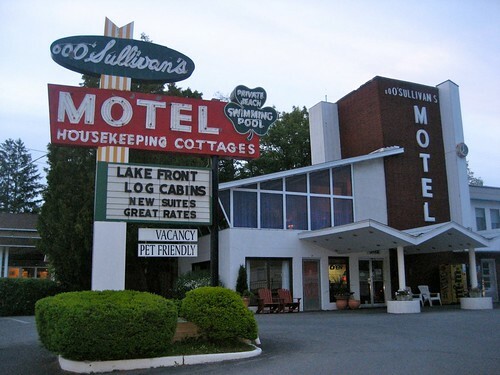 I’m spending the evening looking at their list of Memory Motels which have been featured in the magazine over the years while I plan our rockin retro roadtrip to SXSW in Austin TX…we leave next week! And if you have any tips or suggestions, please put them in the comments, I’m sure they’d help everyone who has to book a hotel / motel. The book Wildwood’s Neon Nights & Motel Memories by Robert O. and Melinda M. Willams was recently published by my fave local publisher Schiffer Books, and is right up my Retro Roadmap alley. The fact that the Doo Wop Preservation League in Wildwood NJ will be hosting a book signing this Saturday 9/25 with the book’s photographer Robert O. Williams is reason enough to tell you all about this tome right now, so you have time to make it to the signing! This book contains over 220 color photographs of the neon signs, vintage motels and vacation memories associated with the history of Wildwood, NJ. For those not in the know, Wildwood is home to the country’s most densely packed collection of 1950’s motels, hotels and businesses. Inspired by post-war optimism about the future, the architectural designs for these mom and pop motels broke the mold with their inventive use of angles, color, materials and subject matter. The signs that beckoned summer travelers to stay the night also exemplified that same sort of exuberance, with swooping arrows, pointing sputniks and enough colored neon to light up the night for miles around. More than just a fond reminiscence or collection of striking photos (there are plenty of both in there), the book is also a cautionary tale about how easily these places can fall prey to the wrecking ball in the name of revitilization and profit. A number of the photos show the heartbreaking reality of demolition sales and the colorful and kitschy places that no longer exist. This book is far from a bummer though, with plenty of bright and detailed photos from Robert and entertaining and informative writing by Melinda. Their original content is featured along with some great vintage shots of the area, including some from RetroStockPix.com (you may remember them being featured here as our Swoonworthy Vintage Motel & Vacation Photos). If anything, the fact that we realize these places may not be here forever, coupled with the impact of the great photos in this book are motivation enough to book your next Wildwood stay at a vintage motel, today! Fans of diner photographs (myself included) have known of Robert’s work with his acclaimed book Hometown Diners, (get your personalized copy right here at this link). Or perhaps you might recognize his images from his years spent behind the lens as an award winning photographer at the Philadelphia Inquirer. Melinda, his wife is also an alumni of The Philadelphia Inquirer and now runs The Williams Group “an agency specializing in marketing, public relations, journalism and photography with an emphasis on nostalgia.” Both of them spent over 10 years in collecting and creating the images and content sandwiched between the covers of Wildwood’s Neon Nights and Motel Memories, and we are all the better for it. I think I’ve been dragging my feet about this post because when I finish it then I have to come to grips with the fact that my summer fun is over. NOT that there isn’t shoulder season and autumn Retro Roadmap fun to be had, but summer went by too fast b/c of my broken foot! 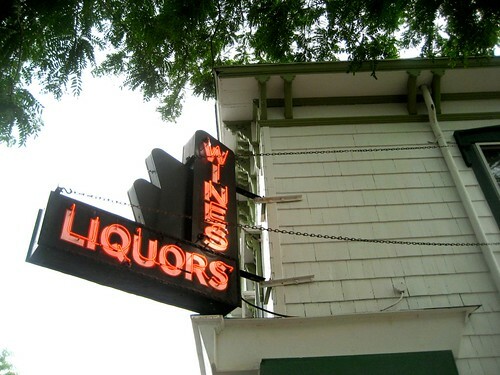 En route to the theatre in the area I snapped a quick photo of this vintage liquor store neon sign. Dig that art deco design! 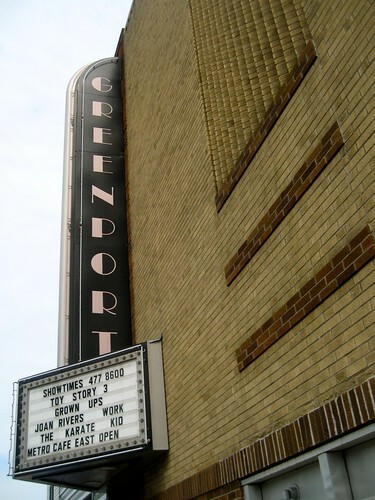 We had walked past the Greenport Theartre on our way into town, and as we made our way back to the car I was pleased to be able to nose around inside, glad to see that it was a bit more gussied up than the austere exterior. Now this is a lousy photo, but I had to share it if only to admit that even someone who thinks they know their stuff can be wrong. You see, I was totally convinced that this decorative ticket booth was an original authentic piece. 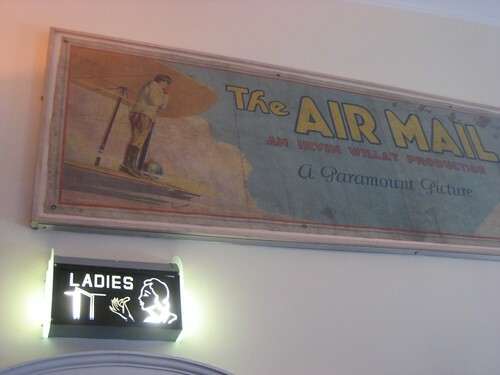 But then, while I was checking out the “vintage” ladies room, my hostesses were chatting with the gal behind the snack counter, who had to admit that even though the theatre was built in 1939, it has been all redone in the past 5 years. 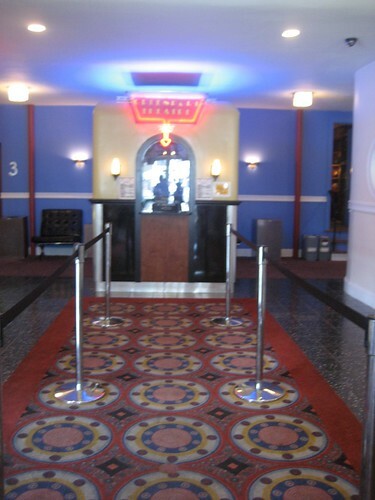 You can read an interesting thread on CinemaTreasures.org where the progress of the renovations to the Greenport Theatre can be relived through the comments. Regardless, it sure does harken back to the olden days of movie going, and the throngs of children swarming around me as I exited the “Ladies” and they exited one of the 4 screens showing Toy Story 3 was a testament to the Saturday matinee. You can also see a shot on the Greenport Theatre’s website of the original neon sign from the Beekman Theatre, now safely on display in one of their screening rooms. Love the script font! And that my friends concludes our visit to beautiful downtown Greenport. NOT that we didn’t find a few gems on the way home that I want to share with you before we bid adieu to summer, but Greenport was a definite treat. 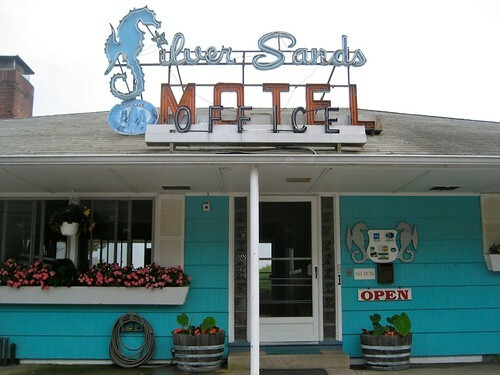 Much like the picture of All American Burger that got me out onto Long Island for a Retro Roadmap reconnaissance, a tip from Erin Mosley of LUPEC Boston made me put the Silver Sands vintage motel on the map, and I’m sure glad I did! We drove down the long driveway and the family sat in the car as I gathered the courage to go in and ask about rates. The woman behind the desk was everso friendly, and gave me some post cards and said I could take a look around the aqua and pink 1950’s era motel. 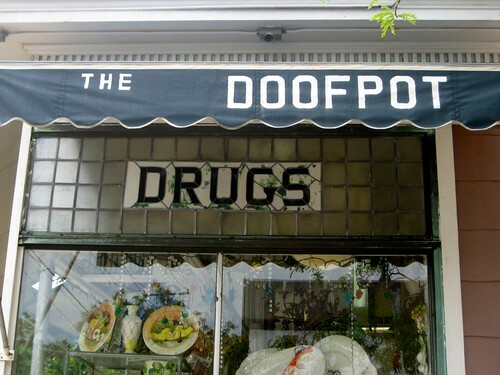 This place is the REAL DEAL people. A cool old vintage motel with that old timey vibe. You can stay in the motel building proper, with its small but private beach, or do it up cabin court style, near the pool. 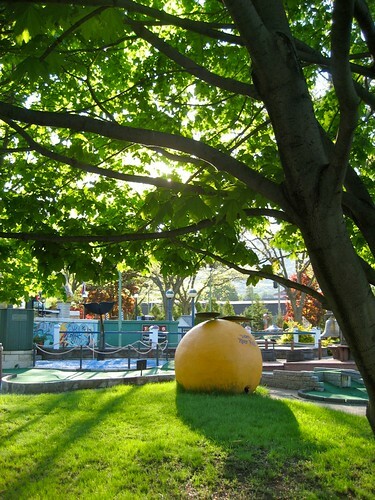 but miniature golf as well! If that isn’t enough, there’s also an on site snack bar! 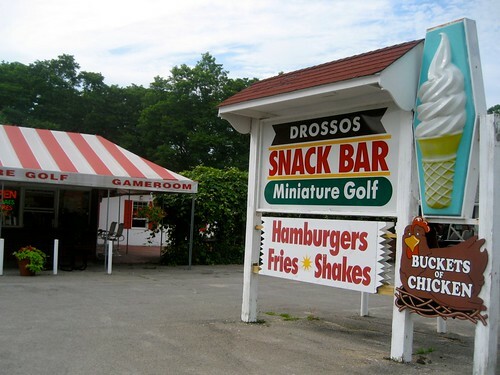 That 3D plastic sign with a soft serve cone on it reminds me SO much of my childhood. Anyone want to join me in a bucket of chicken? 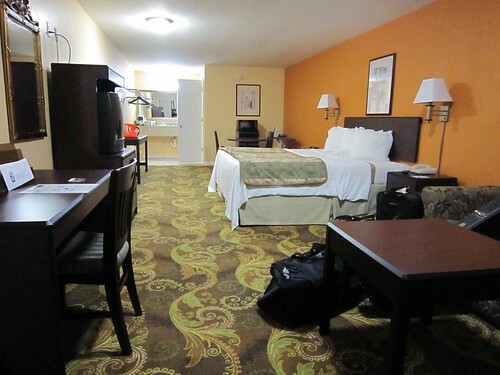 Now I will say, I have not stayed at either of these motels, so I make no promises about the accommodations. However, for vintage charm on a wonderful retro weekend, they get the thumbs up! 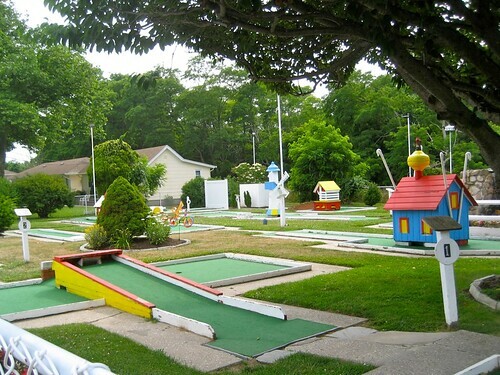 So there you have it – Greenport Long Island NY LI – a definite destination for a retro daycation! 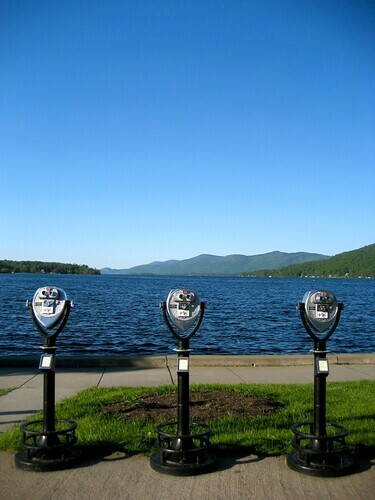 Lake George, NY – A Fun Vintage Vacation Destination! 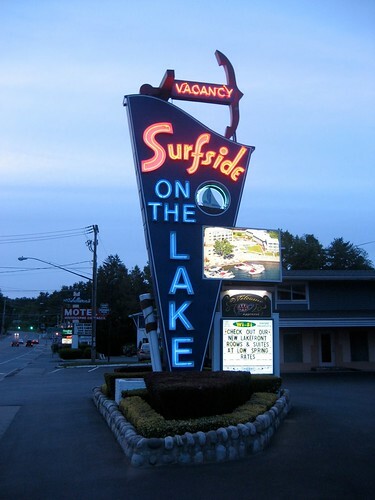 After all these years of saying I wanted to go to Lake George NY and partake in the vintage vacation wonderfulness, Retro Roadhusband and I spent a long weekend up there, just before Memorial Day Weekend. While some of the town has been modernized to keep with the times, there were still plenty of Retro Roadmap worthy places to enjoy, not only in LG proper but in the surrounding area. The timing of our visit was good price-wise, and quiet “have-the-town-to-yourself”wise, but some places were not open for the season, and others were closed on the days we visited. While this was a bit of a bummer, I think that just gives us an excuse to go back up there during the ON season! Now onto some of our vacation slides- I think after seeing just a portion of what we were able to photo, you might want to put Lake George on your retro roadtrip summer schedule! 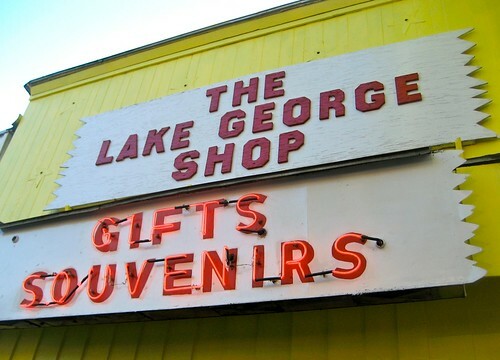 Ah, yes, Lake George – The LAKE! 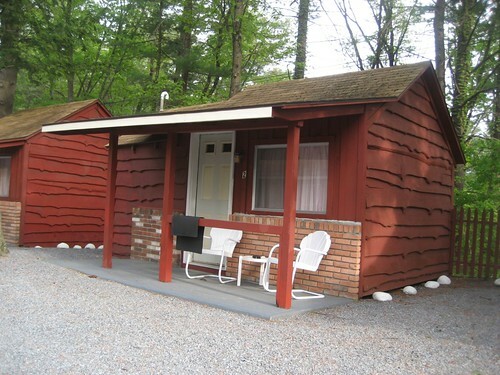 or a roadside Cabin Court with shuffleboard? 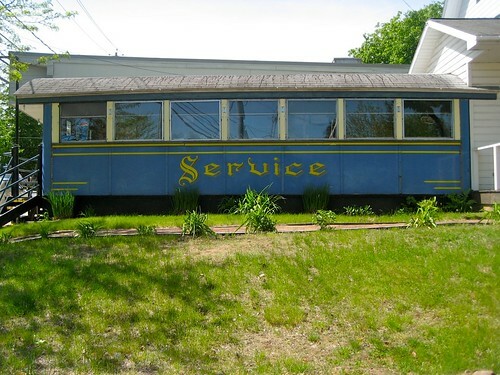 Authentic Worcester Diner in neighboring Bolton Landing – closed when we visited! 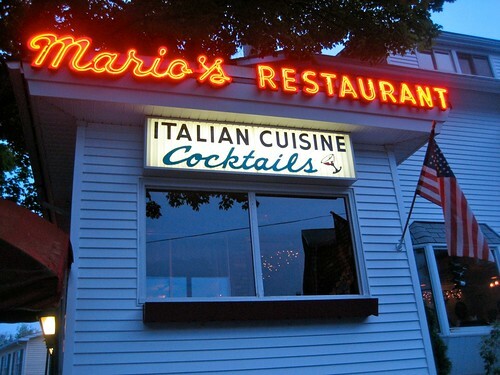 Things we want to go back for but are not photographed: Magic Forest Amusement Park, One Of The Last Remaining Howard Johnson’s Restaurant, Mr. B’s Best Beef Restaurant, Davidson Brothers Brewpub and Cooper’s Cave Breweries in Glens Falls, a boat ride on the lake and also to redo the things we loved ( Martha’s, The Glen Drive In, more mini-golf) and so much more! Do yourself a favor, and if you want an actual vintage vacation destination, check out the Lake George NY area, Retro Roadmap Recommended! Miami Motel Reopening to Make A Difference in The Neigborhood! I’m going to rely on Retro Roadmap pals Visual Ephemera Rick and Tiki Lounge Talk Chris who live closer to Miami to give me the local skinny on the promising remodel of this mid-century modern motel, but for now I’ll just say thanks to Karen-Janine Cohen of the Biscayne Times for highlighting the newly remodeled New Yorker Motel at 6500 Biscayne Blvd. This Miami Modern or “MiMo” motel is celebrating it’s grand re-opening this Saturday, as part of the MiMo Madness festival this Saturday! The Motel New Yorker’s March 20 grand opening will get a boost as part of the “MiMo Madness” festival that same day. The annual event brings food, music, and entertainment to the Boulevard. (Owners) Shirley Diaz and Walter Figueroa are even considering synchronized swimmers in their motel pool, a bit of fun to mark the end of a long and arduous process. Working from old pictures and documents, Diaz and Figueroa are painstakingly recreating the heyday of the New Yorker, built in 1953 and designed by vaunted MiMo architect Norman Giller. The original pink-and-green or gray-and-yellow bathroom tiles look like new. A variety of chairs, mirrors, and other reproduction period furniture is sprinkled throughout the rooms, which also boast flat-screen TVs and other contemporary amenities. Hoping the best for The New Yorker, as well as owners Diaz and Figuero! Thanks for trying to make a difference in your neighborhood, something we all should aspire to, dontcha think?